The Subandriyo family has been wonderful to us. The day after Christmas their sons left for BYUH. This was taken at the Selatan branch Christmas Program on the 25th. Mary opened the packages from home. We had already opened the one from Bob’s family because we thought it only had some books we had ordered for our English class. The Calendar is a big hit here. People love to look through it and ask questions about our family. The Zone Christmas party followed the Selatan branch program so we were not without things to do on Christmas day. It is always good to be with the missionaries. They love to get together and talk about what they are doing and share their successes and their disappointments. There is a lot of laughter and of course a lot of food is eaten. If we could not be with our immediate family, there was no better place to be than with our mission family. This entry was posted in Mission - Indonesia on December 26, 2007 by Bill. I woke at 5:30 and was at the gym 20 minutes later. It was good to have a strong workout. For the first 25 minutes I had the gym to myself – I guess a lot of people have left for the holidays. The attendant asked if I was leaving and I told him that we were here until June. I am feeling much better but it does not appear that my stomach is 100% – there are still times when it does not feel right. We had a nice Skype connection with Tom and his family this morning. The increase in bandwidth seems to have helped some in how long we could stay on. We use the cameras on both ends so we could see the kids and they could see us. William and Kelli are both getting big and William is doing well with his talking. They say he is getting into everything and even tried to improve one of their paintings. It was great to see and talk to them even if it was for only a few minutes. Mary got busy baking carrot cakes for the mission party tomorrow. I convinced her to make two so the elders could have all they wanted. She is also going to make some rice krispy snacks. Some of the elders – especially elder Smith – really liked the last batch she did. While she was doing that I worked on this journal – I had gotten behind again. Then while the first cake was baking we read from the Kitab Mormon. It is very clear in Jakarta today. The lack of traffic over the last few days and a nice stiff wind seems to have blown most of the haze away. When it is like this, Jakarta is a nice city to live in. Unfortunately there are probably only 15 holiday days when it is like this. We had Sam come by so we could go to the store and then drop off the cakes at the mission home so we do not have to carry them in a cab tomorrow. I expected the traffic to be very busy – and it was around Carrefore – but it turned out to be quite light and so we zipped through our errands. The Davis were already at the mission home when we got there so we had a short but nice visit with them and the Walkers before heading back home. The Davises brought pineapples this time – we got two so Sam could have one. They are really heavy ones. The rest of the day was spent not doing a whole lot. Mary did some more baking and then went and passed out plates of cookies and banana bread to the neighbors. We also read more from the Kitab Mormon. I answered a couple of e-mails from students for our Intensive English Class. Hopefully there will be six and not five or seven but I am still not sure at this time. There was a little studying from the scriptures but mainly we just relaxed for the rest of the day. We did watch another Christmas story on Hallmark – at least Mary watched and I dropped in from time to time. We were up and moving around early today because we had to be ready to leave at 7:15 for the Tangerang chapel. Once we got there we greeted the members at the door because the other missionaries came late. It turned out they were bringing an investigator – one that had been found by the Tangerang 2 elders but who lived actually lived in T1. Hopefully the drought of convert baptisms will soon end in T1. All they need is some successes to get things rolling. As usual, Mary played the piano. They could really use a pianist in the branch but they have a player piano so they are not without music. When the meeting started there were not more than 30 members present and that included 5 missionaries, president Gjarot and his family, and those on the stand. It seems that the big branch outing the last couple of days wore people out. By the time we spoke there were about 60 total. Mary and I were the first speakers and so we were careful to leave time for the main speaker who turned out to be president Gjarot. I think our talks went well. Mary spoke on gifts we can give to the Lord and I spoke about the Widows Mites. Both of us spoke in English with interpreters. I am not sure how effective I was because when I asked Sam what I had talked about he did not get it right and he could hear it both in English and Indonesian. Mary said that sister Gjarot gave her a couple of compliments about what we talked about. President Gjarot spoke on Joseph Smith. I had forgotten that today was his birthday. We did not go to any other T1 meetings but stayed in the foyer and greeted T2 members as they arrived. We also started taking pictures of families so we can make up a book for the missionary couple that follow us. I have always been thankful for the few pictures that the Leishmanns left. We are going to try to leave more information about them – like all they names, what they do, etc. We were surprised and delighted to see Elder Thomas with the T2 missionaries. He will be going home on Friday and should arrive in time to spend New Years with his family in St. George. He interpreted for us and did a great job. The elders thought at first that they did not have any investigators but it turned out that two sisters did come to church so both T1 and T2 had investigators. It has been a long time since that was so. Sister Agnes and her daughter Cindy were confirmed today – I was surprised when the branch presidency did not ask the elders to stand in the circle. 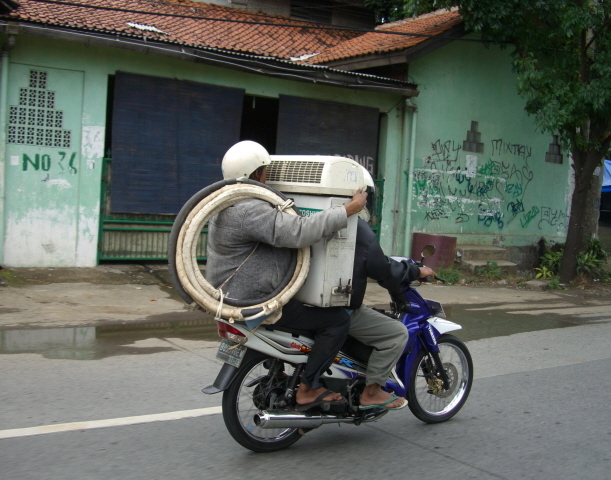 Maybe that is just the way they do things in Indonesia. The first speaker was a sister who was from the Philippines but had been living in Indonesia for 17 years. She was so caught up in trying to express her feelings about the church and the members that she just could not stop and took about twice as much time as she was supposed to. I think everyone understood and the branch presidency adjusted the program and let it run over almost 15 minutes. After the meeting we talked to her about her children – who only speak Indonesian and English. She said that they should do fine and she would send them to an English speaking school. She must have a pretty good job with security. She will be a great addition to whatever branch she is in. The Gospel Principles class was taught by elder Peate who did his usual excellent job. I do wish all the missionaries would get the investigators more involved and talking more. I know it is difficult to get them to respond but it would really make the class more meaningful. At the end he asked me to bear my testimony and I did. I again slept in until almost 7 – amazing. Spent the morning reading e-mail from friends wishing us a Merry Christmas. Went to the UDOT site to look at the current scene around home. They now have traffic-cams along University Parkway and even Timpview Drive so we can see up towards our house. I am surprised that while I miss being in my own house during this holiday season, I am not at all depressed about it. I feel that the Lord has strengthened my spirit because I am doing what I should be doing, where I should be doing it. We read from the Kitab Mormon – Alma 35 and 36. Reading Alma’s recounting of his experience in connection with his repentance is always striking. He must first face his sins and then he is able to be brought to be humble. As I just wrote that I thought about how when he mentioned to the poor Zoramites about how some people must be put in a humbling postion before they repent, he was speaking from experience. Because it was only after the Lord had threatened him with destruction that he turns to Jesus Christ and repents. It is amazing that as many times as I had read those two scriptures – which are only about 20 pages apart – I had never put 2 and 2 together like that. Which just goes to show that no matter how many times you read the scriptures, something new always becomes apparent. We went into the office where Mary worked on English and after Sam had called the PEF holders, she put the info into the computer. She also taught a piano lesson. I spent my time answering some e-mail and going through the ton of paperwork that we have been accumulating. I need to write up some of our new contacts but each time I start my mind seems to go blank. I wrote a couple of pages of lessons based on the Introduction to the Career Workshop. By the time 2 p.m. rolled around I was pretty much done for the day so we did not even go shopping. During the afternoon and evening, we read from the Kitab Mormon twice, took naps – I really need it, and watched a couple of Christmas stories on TV. I keep reading bits and pieces of the D&C, Liahona, and PMG in Indonesian. At times I am pleased with how much I can read and then I will run into a paragraph that I can not even really figure out what it is about. Mary and I discussed how much Indonesian we really know if it is not in context. Many times we know a word because where it is and not so much what it is. But then many Indonesian words – like English words – have different meanings depending on the context. It was not a good night but I survived without losing too much sleep. I forgot to mention that yesterday was Il al-Adhas which is the Muslim day of sacrifice. The Mosques seem to be broadcasting about 20 out of 24 hours. It was not bad when there were one or two going but there were times when it seemed that all were broadcasting at full volume. Anyway I woke at 7:00 feeling OK but certainly not 100%. Even with the late start we had time to read from the Kitab Mormon before Sam came by to pick us up. We headed out to one of the hotel schools that came highly recommended. Sam thought it would take about an hour and because some were still off because of the holiday, it took 20 minutes. I must say that it was not a very impressive looking school, but after talking to the owner and the manager, we came to understand why it was so highly thought of. It costs $1000 a year – which is quit a lot – but it seems to place about 80% of their students and they are trying to get it higher. It seems the problem is that there are some students who just do not get the idea that they have to work at work. The advantage of this school over the much nicer Bandung school is that they take almost everyone who fits their profile for success and has $1000. After meeting with them I felt that good enough that I had Sam call Salim and ask if we could come home teaching. He said yes so we took the hour drive out to his home. His wife was gone for the week and Johan will not be back for a week so we just had a short visit with him. He is a good man who is very faithful and has been blessed. Hopefully his son and daughter will continue in their father’s footsteps. We then came home and we have spent the rest of the day reading from the Kitab Mormon – a total of almost 4 hours today – napping, and watching a little T.V. Mary also worked on her talk for Sunday and prepared a nice dinner of omelets and hash browns. I decided I would eat it all and let my stomach do what it is going to do. Our reading in the Kitab Mormon was Alma’s great lesson on faith to the Zoramite poor. It sings even in Indonesian. It is Christmas morning in Indonesia and we hope one and all a wonderful day with family and friends. May we remember the birth our Redeemer and give Him the gift of Love each day of the year ahead. This entry was posted in Mission - Indonesia on December 24, 2007 by Bill. The first picture has gotten more reaction here in Indonesia than any I have taken. 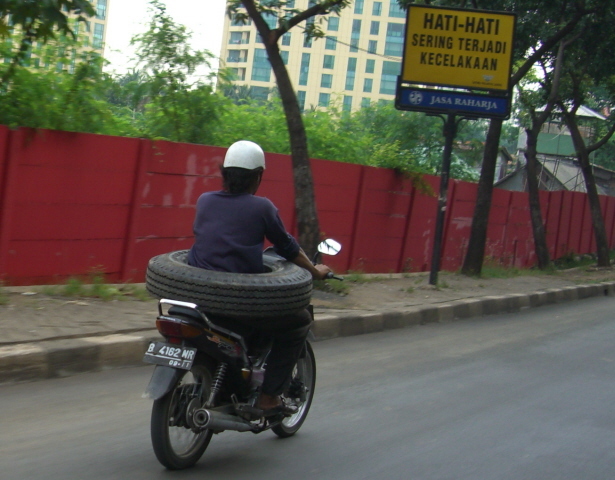 I am not sure if he is carrying the tire just so he has a spare if one of his goes flat, if it his version of an air-bag (note that the sign says Hati-Hati which means ‘be careful,’)or he is just deliverying the tire. The next two came on the same day about 2 hours apart. The one on the left is a washing machine and the one on the right is a room air-conditioner and what they need to install it. I keep hoping to snap a kitchen sink being carried. It is about all I need to complete my collection. This is the Polytron 32″ TV I won from BCA. Mary enjoying the Christmas party that her English class at the Service Center threw this week. Finally our best Christmas present of the year. This entry was posted in Mission - Indonesia on December 21, 2007 by Bill. We were able to attend the funeral of Joshua Samad the young son of Looky and Diana from Tangerang 2. They have a beautiful custom of spreading flowers over the coffin and the grave. The young lady in red became my close friend at the Limbong’s Christmas party. She loved to chew on my missionary badge. The picture of Mary is here just because I liked it. The last picture is our Christmas decorations and presents for this year. Other than an hour of discomfort and getting up a few times, I slept well. Went to the gym and almost no one was there. Of course it is a holiday here but not one where all the Muslims have the day off so things are closed. As usual the Christens take off on the Muslim holidays and visa-versa, so I imagine a lot of folks are off today. Sam is going to borrow our car so he can drive out to see his family. Due to things that will be going on in his branch he will not be able to go see them on Christmas day. Except for my small problem we had a good morning. We read more from the Kitab Mormon and are now about a day behind where we should be. Quite possibly we will be caught up by tonight. We are not going out at all but will work on English lessons and our talks. I wrapped Mary’s Christmas presents and so now we have a rather festive looking Christmas area. Daisy came to clean the apartment. She now has a full time job at the Area Office substituting for a sister who is going to have a baby. It will be perfect for her because it is only for a couple of months and hopefully by then she will have other opportunities. I got to feeling so bad that I decided to take a nap. Actually I laid down to read from the A&P but instead fell asleep. The nap did not help a lot – I am still tired and still not well. But it is only annoying and so I will be able to write some more English lessons during the day. To make the rest of the day short, I never felt good all day. But I did work on English, read from the Kitab Mormon and A & P. The Ajaran & Perjanjian is as easy or easier to read than the KM. The ideas are repeated more often and there are less flowery sentences. I did not even roll out of bed to pray until almost 6. But I quickly got up and went to the gym. I did some extra time on the bike because I am eating too many cookies. I am hoping that I will not gain any weight over the holiday season. Back at the apartment we had our regular morning and read 4 ½ pages from the Kitab Mormon. Since today and tomorrow are basically holidays, we should be able to read between 20 and 25 pages. Today we passed the half-way point. It is interesting that many of the words we did not know the second time through still stumps us this time. They are either words that are not used very often or just will not stick in our minds. Today I took memperhatikan for memperingatkan – so instead of the lord ‘watching over’ his people I had him ‘warning’ them…unfortunately Mary agreed with me. On the positive side, one of the books that Mary ordered and Lisa sent to us is called ‘10 skills you really need to succeed in school.’ It is a great book to use as a basis for many, many lessons and the concepts and skills taught will help the students in all of their classes. The task now is to figure what to teach, how to teach it in a way that increases their English and is fun. After lunch we took naps – at least I took a nap. Then we read for well over an hour from the Kitab Mormon – we are trying to make up for some of the days we did not read or only read for an hour. We read where Alma gives his great discourse on wanting to have the voice of an angel. It is such a wonderful part and so full of things to think about. Like the better parts of the Book of Mormon – that is the part that is not about geography, lists of goods that someone is rich in, or battles and their results – it just breathes of the spirit and cries out to be pondered and absorbed into my life. I spent much of the night coming up with some suggestions and ideas to give the teachers of the new English program. Ideas that we hope they will think about and find a way to incorporate into their classes. One of the main one is the 20 – 80 rule that the teacher only talks for 20% of the time. Unfortunately here in Indonesia and elsewhere the opposite is true. The teacher often speaks for 80% of the time and maybe gives the class members 20% of the time to respond. It is interesting that the leaders thought so strongly about the need to improve the teaching in the church that they used a whole worldwide Church Leadership session on this subject. The 20% rule was taught in those lessons. We read for the third time from the Kitab Mormon. We read over 13 pages today and it was really good. There are still words that we do not remember even after looking them up at least two other times. But each time we read there are fewer and fewer of these. It was a good day – not a greatly spiritual one but enough spiritual experiences to ponder over. Like changing the subject of my talk on Sunday, the great need I have for the Lord’s help in preparing the English class of Solo and eventually all of Indonesia, and for feeling the spirit when reading the Kitab Mormon. There was one problem that came up. It seems that I ate something that is disagreeing with my stomach and so I visited the bathroom more than usual and probably will for the rest of the night. I can not think of anything I ate in the last 24 hours that might have caused this.